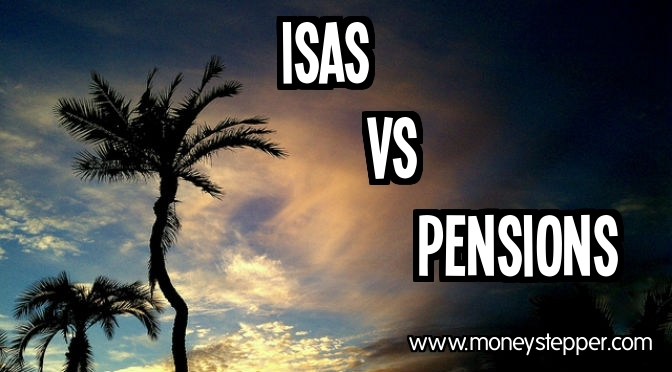 Investing in ISAs vs Investing in Pensions - which is better? Investing in ISAs vs Investing in Pensions – which is better? Should I invest in an ISA or invest in a pension? Investing in ISAs vs Investing in Pensions – This is a question I have heard a lot lately, especially since the introduction of the “New ISA” and the new freedom for pensions in the April 2014 budget. Firstly, we need to understand what each “product” provides. An ISA (individual savings fund) is an account where you can invest in cash, bonds & equities. It has a maximum contribution level each year. From July 2014, the maximum annual contribution will be £15,000. All income and capital gains earned within an ISA are completely tax free. Funds can be withdrawn from an ISA tax free at any time. However, you can only contribute £15,000 each year in total (independent of withdrawals). Any contributions to the fund come from your money. Therefore, any contribution you make to your ISA fund will have already been subject to income tax. A pension is generally defined as a fixed sum to be regularly paid to a person upon retirement. For the purposes of this question, we shall be referring to a personal pension. This is essentially a fund, just like an ISA, where you can invest in cash, bonds & equities. It is a tax “wrapper”, but in a slightly different way to an ISA. Contributions are made to a pension directly from your salary, and hence are made before income tax deductions. 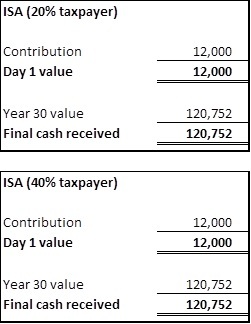 Therefore, as a 20% taxpayer, to be able to make a £15,000 ISA contribution, you will have to earn £18,750. Although pension contributions are not taxed “on the way in”, they are taxed “on the way out”. The first 25% of your retirement funds can be withdrawn tax free upon retirement. The remainder will be taxed at your income tax band in retirement. What is a matched pension? Another additional benefit of pensions is that most employers will match part of your pension contributions. According to research by Tower Watson, the average matching offered by FTSE 100 companies in the UK is 9.3%. This means that for any amount that you put into your salary, up to this predefined amount, your company will simply give you the same amount of extra cash. ISAs vs Pensions – Which is best? Let’s have a look at the figures. All of these assumptions can be altered to match your exact situation in the spreadsheet following the results. Download it for free! So, should I invest in a pension or an ISA? Generally, if you can keep the money in your long-term investments until you hit state retirement age, you should invest in a pension. In all scenarios we run above, except for one, the final cash received via a pension is better than that provided by an ISA. The only situation where ISAs outperform pensions is a non-matched pension scheme where you are currently paying 20% tax (annual income less than £41,865), but 40% in retirement (over £41,865). How likely is this situation? 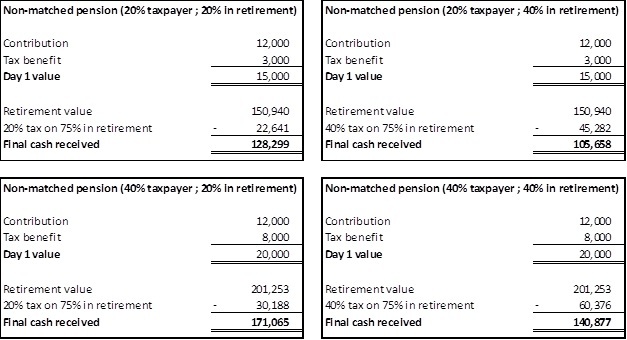 Assuming a 4% draw down rate, you would need a pension pot of £1,046,625. Whilst this seems large, over 30 years at 10% annual returns, you would only need an annual contribution of £6,363 each year into your retirement savings to reach this amount. This is achievable with an annual salary of £30,000 (20% taxpayer). Whilst ISAs do return significant less cash upon retirement than pensions (82% lower for a 40% taxpayer, 20% in retirement and matched pension), they do have several other advantages which are worth considering. Flexibility: An ISA is accessible at any time and funds (depending on how invested) can usually be liquidated very quickly. This means that if huge emergencies (or once in a lifetime investment opportunities) crop up; you will have the funds available. It also means that you can withdraw the full amount (or any amount) at any time – whereas with a pension you can only withdraw tax-free (for the first 25%) or without significant tax penalties (for anything over 25%) at the state retirement age. Simplicity: Generally, ISAs are much simpler. They are easier to understand, they are easier to open, they are easier to switch provider, they are easier to track – they are just easier! Freedom: Often, employer pension schemes are not completely open and funds can only be invested in a limited number of options. However, in an ISA, you have much more freedom to invest your funds wherever you wish. From July 2014, the limit for annual contributions into the “New ISA” is £15,000 per year. This is the maximum amount you can put into your account each year, for which gains will be tax free. 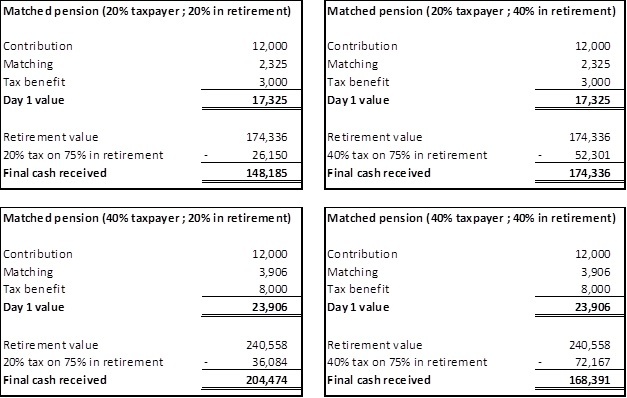 For pensions, the HMRC website shows that the annual contribution is currently £40,000 per year. However, this has ben falling over the past few years. There is also a lifetime pension scheme allowance. This is currently at £1.25m but, interestingly, it has also been falling over the past few years. This isn’t something that will impact too many of us. To break the lifetime limit of £1.25m, we need to contribute the full £40k allowance every year for 32 years. Assuming a retirement age of 65, this would mean maximizing EVERY SINGLE YEAR from the age of 33: fairly unlikely for most people. However, many people may be contributing more than the maximum ISA limit of £15k per year and hence it is good to be aware of these limits for pensions. It is also important to appreciate that almost everything related to ISAs and pensions can, and will, change. As with everything in investing, I think it is essentially to make the mathematically optimal decision. However, it is important to keep in mind that it is only the optimal decision today on the current information available. ISAco tells us that, in the last 25 years, there has been 23 significant changes to ISAs. Pensions on the other hand have changed (at least slightly) in almost every budget since budgets began! Is there room in my budget for charity? This has been so informative. To be honest this is the first time I’ve understood how pensions work. I pay into a teachers pension with work, I’ve been told its a good one but I’d like some savings in the future too. Once my debt is cleared I’d like to start saving for my retirement. Thanks DBC – I’m really glad you found it useful. Did you use the spreadsheet? Nice explanation of the two choices and the spreadsheet is awesome too. It should be downloaded by everyone. It really helps to see my exact situation and what is in my best interest. I pay 6% of my income into a pension and my employer matches it. As a teacher, I feel fortunate to still have this option. However, starting next year when my salary maxes out, I’ll begin investing into a 403(b) to really boost my retirement savings and possibly retire earlier than 65. For me, Employer contribution pensions are pretty much a no brainier. It is what you do with savings above and beyond that. The main issue with pensions is when you can access them. By the time I get there it will probably be over 60 before you can start drawing the pension. So if you want to either retire early or have enough to quit the day job and do something else, you need money outside of a pension that will see you through – which is where the ISA comes in. So it comes down to your plans. How much do you need or want before you draw your pension. It is highly likely the earlier freedom is worth the Lower return, as long as the pension is well enough funded to keep you in a decent way of life (this should be the first priority).